Cramm deck cranes are the ideal cranes to hoist your equipment such as tenders, jet skis and submarines to and from your super yacht. Our cranes offer maximum efficiency in that they can be used for cargo handling applications as well as rescue boat and life raft hoisting. All our yacht equipment products are designed to perfection to match the yacht design, in or out of sight. Depending on your requirements and ideas, Cramm can supply a crane to match every need. For example, Cramm has engineered a fully custom-made deck crane with a hoisting capacity of SWL 15 tonnes and a teak gangway on top to show one of our customers our possibilities. Contact us to find out more about what we can offer you. To lower your equipment into the water or lift it on to the quay, our modular range of deck cranes have a reach from 3 metres up to 10 metres and can hoist up to 6.5 tonnes of cargo or 3.25 tonnes of MOB/rescue equipment. When a longer or heavy-duty deck crane is required, Cramm offers customised solutions to create any required fixed boom, telescopic or knuckle boom crane configuration. If required, all deck cranes can be rotated 355 degrees to give maximum flexibility. 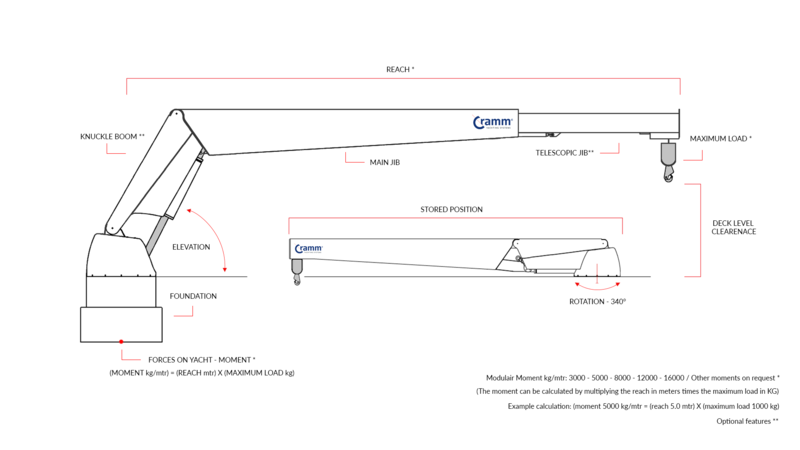 Cramm offers two types of deck cranes: non-telescopic and single telescopic. The single telescopic crane offers a higher reach while requiring less deck space. The deck crane can be configured with a latch hook for cargo or a quick release hook for rescue operations. Special fibre rope is supplied as standard as the hoisting cable, as this offers more comfort and easy handling. However, this can be changed to a galvanised steel cable for extra strength, on request. Other options that can be installed include a jib light for extra safety and a radio remote control for increased flexibility. During the final testing phase, an agent from a certified body witnesses that the crane is secure, safe and delivers the required capacity. All Cramm deck cranes satisfy uncompromised quality and design standards (ISO, LY2, LY3 and SOLAS). To increase the lifespan of our products and provide the yacht equipment with a quality finish, all products are faired and painted with the highest yacht quality paint available. We make deck cranes for tenders, rescue boats, life rafts handling, MOB boats and for cargo handling applications. Our cranes are remote controlled at two speeds or proportionally. Rescue cranes are always equipped with cable controls, while cargo cranes have the option of radiographic controls. Rescue cranes can be provided with certification from Lloyds Register of Shipping, Bureau Veritas or others if required. All our cranes are included with a design appraisel document (DAD) to guarantee maximum safety on deck. All deck cranes are also designed in accordance with LAME regulations. A knuckle boom crane is the ideal crane for hoisting equipment over the bulwark of the yacht. A knuckle boom crane has an extra hinge in the crane enabling it to hoist equipment higher without the need for a longer deck crane. Furthermore, knuckle boom deck cranes can reach further away from the bulwark compared to a standard boom. When new equipment such as a tender is being added to the yacht and the current deck crane is unable to lower the tender into the water because the bulwark is blocking the hoist, a knuckle boom crane is the perfect upgrade, providing the required hoisting without the need to make changes to the yacht or bulwark. Cramm offers a wide range of modulair deck cranes, our modulair deck cranes series are: 3000, 5000, 8000, 12000 and 16000 kg/mtr. This means when 1000 kg needs to be lifted over a 5 meter reach a 5000 series crane is needed. When 1200 kg needs to be lifted over a 5.5 meter(6600 kg/mtr), a 8000 series deck crane is needed because the 5000 series crane would not be sufficient. Other moments or special cranes can be custom made.